In Chiapas, dissatisfaction and revolutionary fervour has been growing for over 500 years, due to the extreme poverty, discrimination and repression faced by indigenous groups since the Spanish conquest. Emiliano Zapata was one of the leaders of the Mexican Revolution at the beginning of the twentieth century. Indigenous and incorruptible, he refused to take power; his slogan was “land and freedom”, he believed “the land belongs to those who work it”, and “it is better to die on your feet than live on your knees”. Betrayed and assassinated in 1918, legend says that he is not dead, but waiting in the mountains. Since the 1970s, guerrilla groups had been growing in Chiapas. The Ejército Zapatista de Liberación Nacional (EZLN), named for Zapata, was founded by six people in secret in the Lacandón Jungle of Chiapas on 17th November 1983, and spent over ten years working with, and learning from, the indigenous peoples. The result was an uprising. General Absalón Castellanos Domínguez, ex-governor of Chiapas is taken as a prisoner of war by the EZLN. The First Declaration of the Lacandón Jungle is issued on January 1st. The Dialogue for Peace and Reconciliation in Chiapas begins on 20th February, in the “Cathedral of Peace”. The communities consult about the outcome of the dialogue. The Mexican army is building up its forces in Chiapas. It now has at least 10,000 troops. Second Declaration of the Lacandón Jungle. The communities decide to reject the dialogue’s conclusions but not to go back to war. The Zapatistas hold a national meeting for civil society, the National Democratic Convention, in a specially constructed centre in Guadalupe Tepeyac, named ‘Aguascalientes’. Zapatistas declare a red alert due to an increase in military incursions and overflights. The EZLN forces slip through the military encirclement and set up 39 autonomous municipalities. The next day the Mexican currency collapses, and US President Clinton agrees to a US$30 billion bailout for Mexico. Third Declaration of the Lacandón Jungle. Chase Manhattan Bank memo calls for the Mexican government to eliminate the Zapatistas. Without warning the government puts out arrest warrants for the Zapatista general command, and the army goes on the offensive in Zapatista areas. The EZLN retreats to the hills, holding their fire and appealing to civil society for support to avert a massacre. 30,000 people are displaced as the Mexican army advances into the communities. National and international mobilisations call for an end to the war. Dialogue begins again between the Zapatistas and the government. The National Consultation for Peace and Democracy is held by Zapatistas throughout Mexico. Over a million people vote. New dialogues begin in San Andrés Larráinzar. Arrest of Fernando Yáñez Muñoz, accused of being “Comandante Germán”. Fourth Declaration of the Lacandón Jungle. The Zapatistas call for the creation of the FZLN (the Zapatista Front of National Liberation) and the holding of a national and international gathering. Marcos goes to San Cristóbal to address the National Indigenous Forum called by the Zapatistas. The first campaign to expel foreigners begins in the wake of this. On the 10th the first large scale civil mobilisation of Zapatistas takes place when hundreds march on the town of Guadalupe Tepeyac which has been occupied by the military. On the 16th the San Andrés Accords on Indigenous Rights and Culture are agreed and signed after months of negotiations, outlining a programme of indigenous rights and autonomy and land reform. To mark International Women’s day, 5,000 Zapatista women march through San Cristóbal. The First Continental Encounter for Humanity and against Neoliberalism is held in La Realidad. Two Zapatista prisoners, Elorriaga and Entzin, are released. The First Intercontinental Encounter for Humanity and against Neoliberalism, the Intergalactica, is held in five different Zapatista communities in Chiapas. About 5,000 people from 43 countries attend. The Zapatistas react to the growing militarisation and the racism towards their delegates at the talks by breaking off the peace negotiations. Comandanta Ramona attends the first National Indigenous Congress in Mexico City. President Zedillo formally vetoes the San Andrés Accords. The ‘Low Intensity War’ intensifies. The largest demonstration of Zapatistas until now takes place in San Cristóbal, demanding the government keeps its word. The government effectively rejects the law drafted by Cocopa (The Commission of Concord and Pacification) which would have implemented the San Andrés agreement. As the state-sponsored paramilitary groups become more blatant in their operations, the military build-up reaches massive proportions. Military bases are now near 80% of the Zapatista communities. The Second Intercontinental Encounter for Humanity and against Neoliberalism begins in Spain. Despite attempts to stop Zapatistas from leaving Chiapas, 1,111 travel to Mexico City for the National Indigenous Congress and to observe the founding of the unarmed FZLN. Build-up of extreme violence by paramilitary groups. On December 22nd 1997 pro-government paramilitaries enter the community of Acteal, and over the course of several hours massacre 45 unarmed people there, mainly women and children belonging to the pacifist group, Las Abejas (Zapatista sympathisers) who are praying for peace. “A year of government war against the indigenous communities of Mexico”. In the immediate aftermath of the Acteal massacre, the army starts to raid Zapatista communities, prompting a massive international response. In retaliation the government starts a campaign to expel international human rights observers. Over 150 are expelled over the next two years. The army begins to dismantle autonomous Zapatista municipalities. Over 1,000 troops and police invade four communities. The autonomous municipality of San Juan de la Libertad is attacked by the army on June 9th. At least eight civilians and one policeman are killed. The resulting outcry from civil society temporarily halts the army offensive. Fifth Declaration of the Lacandón Jungle. A meeting is held between the EZLN and ‘civil society’ to plan the future consultation. The Zapatistas send one man and one woman to every municipality in the country to hold the Consulta Nacional (national referendum) about the recognition of Indigenous Rights and Culture. Over 3 million Mexicans take part, agreeing that the San Andrés accords should be implemented. State police occupy the autonomous community of San Andrés and install a PRI mayor. The next day, 3,000 unarmed masked Zapatistas take back the community, and restore their own elected representatives. In the wake of the Consulta, the Zapatistas call the Second National Gathering of Civil Society. 2,000 people attend. Meanwhile the state continues a new strategy of staging photo calls at which small groups of ‘Zapatistas’ come out of the jungle and lay down their arms. The National Encuentro in Defence of the Cultural Heritage is held in La Realidad. A major confrontation blows up as the military try and build a new road to encircle the Zapatista heartland. The army occupy Amador Hernandez. The government once more tries its strategy of offering new peace talks before it has implemented what has already been agreed at San Andrés. New wave of harassment begins against foreigners in Chiapas, along with a further build-up of troops. Reports emerge that the government gave some reporters paid positions in the army in order to buy favourable coverage of their war in Chiapas. The government builds towards a major operation in the Selva (jungle) under the pretext of protecting the Montes Azules biosphere. The PRI lose the presidential election to the PAN’s Fox after over 70 years in power. However, few real changes emerge, and the low intensity war and paramilitary attacks continue. The PRI is defeated in the elections for the governorship of Chiapas, but continues to hold a majority in the state congress. Despite Fox’s talk of implementing the San Andrés Accords, the conflict continues. On taking office, Fox orders the army to withdraw from a few positions in the rebel area of Chiapas as a token goodwill gesture. The Zapatistas announce they will march to Mexico City to demand the government approve the Law on Indigenous Rights and Culture. The peace process starts to unravel as the army continues to maintain bases at five of the seven sites they must withdraw from before dialogue can start. The EZLN march to Mexico City sets off on the 24th, despite government attempts to sabotage it. ‘The march of the people who are the colour of the earth’ reaches Mexico City, where 250,000 people greet their arrival in the Zócalo (the main square). After some delay the PAN reverse their initial decision, and the Zapatistas are invited to address the national Congress. Comandanta Esther makes the address. On the same day the army abandons the last of the seven bases demanded by the Zapatistas. The Zapatistas arrive back in Chiapas. The government passes the Law on Indigenous Rights and Culture, but omits the most important parts: the Zapatistas and indigenous groups throughout Mexico reject it. There are reports of major troop movements in Zapatista areas. A long period of silence follows, but in the background the ‘Low Intensity War’ goes on with several attacks in October. Conflict is building over government plans to expel Zapatista communities from the Montes Azules Biosphere. Three more Zapatista prisoners are released and another Encuentro takes place in Belen, Brazil. Paramilitary activity is stepped up with attacks on the autonomous townships resulting in four dead, more than twenty wounded, and many displaced. The Supreme Court upholds the watered down version of its Law on Indigenous Rights and Culture, ignoring over 300 complaints raised against it. Widespread protests follow. A political solution to the conflict becomes less and less likely. First edition of a new Zapatista magazine, Rebeldía, is published. 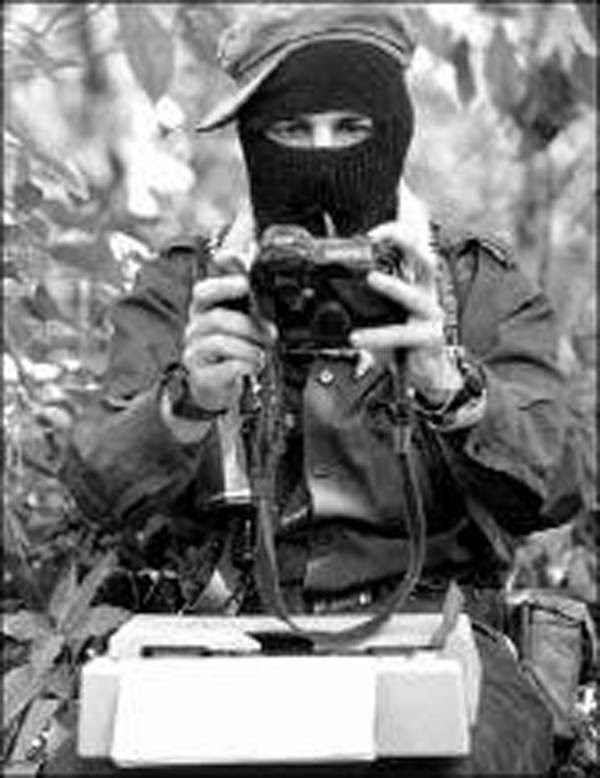 Subcomandante Marcos sends a series of letters and communiqués an Opportunity for the Word, in relation to the Basque conflict, breaking the EZLN”s silence. The first displacement of indigenous villages begins in the Montes Azules biosphere reserve. Zapatista communities located there pledge to stay and fight. To mark the ninth anniversary of the uprising in Chiapas, over 20,000 Zapatistas gather in the main square in San Cristóbal, taking over the city again. During this gathering, the EZLN break their two year silence as seven comandantes and comandantas give speeches criticising the neoliberal policies of the Mexican government and the USA, showing solidarity with other struggles in Mexico and around the world, and affirming their decision to implement the San Andrés Accords. The EZLN start to release a series of thirteen articles marking a Calendar of Resistance, linking the struggles from below throughout Mexico. The Zapatistas speak out against the war in Iraq. Luxury ecotourism projects are being pushed forward in the Montes Azules biosphere reserve threatening the jungle and the communities living in it. New military checkpoints are being installed, and there is an increase in paramilitary activity. Without asking anyone’s permission, the Zapatistas implement the San Andrés accords themselves in their territories. On August 8th, at a major celebration in Oventic, attended by more than ten thousand people, they formally declare the death of the Aguascalientes, and the birth of the five autonomous Caracoles, political and cultural centres, and their Good Government Juntas, who “govern by obeying”. This marks the full separation of the Zapatista civil and military structures and authorities, and the symbolic creation of full autonomy. “There has been a time to ask, a time to demand, now is the time to act”. The first broadcast is made by Radio Insurgente, the Zapatista radio station which brings news to the remotest communities. The year began with celebration of the anniversary of 20 and 10: the Fire and the Word, the Zapatistas’ tenth year of public existence, which followed a previous 10 years of clandestine organising in the Lacandón Jungle. The year is marked by an increased military and police presence, and by renewed efforts to remove communities from the Montes Azules biosphere reserve “in the interests of preserving the jungle”. In fact, 52 ecotourism projects are being set up, a road built to Laguna Miramar and a bridge built over the River Jataté. A large demonstration of Zapatistas carrying water to a community in Zinacantán, whose water supply has been denied to them, is attacked by the PRD authorities. 29 Zapatistas have to be taken to hospital and 125 families flee for several weeks. The first financial accounts of the new JBGs are summarised. They are doing well. The first episode of the story Muertos Incomodos, The Uncomfortable Dead, is published in La Jornada, with alternate episodes written weekly by Marcos and Paco Ignacio Taibo. It is subtitled What’s Missing is Missing. Afier a period of silence, the EZLN call a Red Alert in Zapatista territory. Nine days later, on 29th June, they publish the Sixth Declaration of the Lacandon Jungle, usually known as The Sexta, the first such document they have released since July 1998. It defines who the Zapatistas are, how they got to where they are now, how they see the world, what they want for Mexico and the world, and what they want to do now, which is to go in search of what is missing, the rest of Mexico, and to plan another Intergalactica. 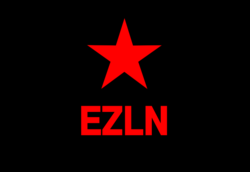 The EZLN announce the birth of a new initiative, to be known as the Other Campaign (La Otra), to bring together leftist groups all over the country and try and decide on a nationwide plan of action to bring about radical social change. The Other Campaign begins with a series of preparatory meetings in Zapatista territory, where unions, campesino organisations, indigenous groups, social justice organisations, collectives, NGOs, and all groups and individuals “from below and to the left” come from all over Mexico to present themselves, their struggles, and their vision of how the campaign could be brought about. The meetings culminate in a plenary in the Caracol of La Garrucha, where the main points and general principles of the campaign are agreed on, and the Other Campaign is handed over to its adherents. 64 leftist political organisations, 118 indigenous groups, 197 social organisations, 474 NGOs, groups and collectives and 1898 individuals have already signed up to become part of the Other Campaign. The campaign is launched on 1st January when Subcomandante Insurgente Marcos, as Delegate Zero, begins a tour of every state in the country to make contact with all the groups who are taking part in the campaign. The tour is due to return to Chiapas in June, just before the presidential elections… if everything goes according to plan. Ramona dies of kidney failure on 6th January. The Other Campaign is forced to halt in Mexico City, following a devastating police attack on the People’s Front in Defence of the Land in San Salvador Atenco, during which 275 people are arrested and detained, two killed, and 23 women sexually abused by police. Demonstrations are held in thirty countries. A Red Alert is called in Zapatista territory, and the Caracoles and communities are closed to outsiders. The Other Campaign resumes in the north of Mexico. The Caracoles are re-opened. The Zapatistas announce a national and cross-border consulta to be held about the internal workings of the Other Campaign, and a forthcoming intergalactic gathering. The Other Campaign reaches the bridge from Ciudad Juárez to the United States. Hurricane Stan devastates Western Chiapas and Tabasco. The Zapatistas are among the first to bring aid. Zapatista support bases block all major roads in Chiapas in support of the APPO in Oaxaca. First phase of the Other Campaign comes to an end after travelling 45,000 kilometres. The First Encounter between the Zapatistas and the Peoples of the World is held in Oventic over the New Year, giving the Zapatistas the opportunity to explain their autonomous organisation to over 2,000 people from 43 countries. The Zapatistas set up International Peace Camps at Huitepec near San Cristóbal, and in the Cucapa lands in el Mayor, Baja California, under the title The Indigenous People in Defence of Life, Culture and Nature, Below and to the Left. Launch of the International Campaign in Defence of the Indigenous, Peasant and Autonomous Lands and Territories of Chiapas, Mexico and the World, endorsed by, as well as the Zapatistas, groups including the Landless Movement of Brazil (MST) and the international agrarian reform organisation Via Campesina. This launch also marks the beginning of the second phase of the Other Campaign, travelling to the north of Mexico, this time with the participation of 15 EZLN commanders. Zapatista commanders meet with Other Campaign adherents from across the US border. Completion of the first part of the second phase of the Other Campaign in Northern Mexico. Commanders return to Chiapas. Attacks on Zapatista communities by paramilitary groups such as OPDDIC, as part of their continuing campaign to take land ‘recuperated’ by the Zapatistas in 1994, are increasing. The Oventic Junta denounce government negligence regarding health care in San Juan Cancuc. Zapatista health promoters had detected an outbreak of whooping cough in non-Zapatista communities and children had died. The Second Encounter between the Zapatistas and the Peoples of the World is held in three of the Zapatista Caracoles, Oventik, Morelia and La Realidad. More than 2,000 people attend, including representatives from twenty different campesino (‘peasant’) organisations from all over the world. Two more communities are expelled from Montes Azules. Two Zapatistas are shot and seriously wounded in Olga Isabel. Zapatista support bases in 24 de Diciembre community are resisting the constant threat of a violent forced eviction by their neighbours from the Union of Ejidos of the Jungle (UES). The Mexican army enters Eastern Chiapas in search of ‘EPR guerrillas’. OPDDIC members attack Zapatistas in Bolon Ajaw, 3 are captured, brutally beaten and seriously injured. Report by CAPISE lists 13 communities at very serious risk from paramilitaries. In a communiqué issued on September 22 the EZLN suspends the second stage of the Other Campaign tour in the face of the rapidly deteriorating situation faced by Zapatista communities: the evictions, paramilitary attacks, invasions, persecution and threats. The Encounter of the Indigenous Peoples of the Americas (Encuentro Indigena) is held at Vicam, Sonora, in the territory of the Yaqui people. This gathering was inspired during the Other Campaign visit there. Only Marcos attends, after the commanders are stopped at a military checkpoint. The threats from paramilitary groups to attack Zapatista communities continue. The Chiapas governor Juan Sabines calls for an investigation into OPDDIC, four members are arrested and jailed for the shootings at Olga Isabel. The campaign to boycott the waterfalls at Agua Azul begins. The first International Conference in Memory of Andrés Aubry takes place in San Cristóbal de Las Casas. Marcos announces that this will be the last time that he or any of the commanders will appear or speak in public for a long time: “the foul smell of war has returned to our lands”. The Third Encounter of the Zapatista Peoples with the Peoples of the World; Comandanta Ramona and the Zapatista Women, is held over the New Year in La Garrucha. Over 3,000 attend. Violence increases in the Agua Azul region. NAFTA abolishes protective tariffs on corn, beans, powdered milk and sugar. The incessant attacks against Zapatista communities continue, especially at Agua Azul/ Bolon Ajaw. Political prisoners in Chiapas go on hunger strike, led by Alberto Patishtán. The hunger strike leads to the release of over 300 Chiapas prisoners, though not of Patishtán. Violence is escalating. Large numbers of Mexican army troops and police enter communities in convoy, in one case accompanied by helicopters, in at least four regions of Chiapas. The US Congress agrees to give Mexican army billions of dollars to “fight drug trafficking”, under the Merida Initiative, widely known as Plan Mexico. In an act of serious provocation, a convoy of 200 Mexican Army troops in tanks and trucks, together with state and local police, attempts first to enter the Zapatista Caracol of La Garrucha, and then two local communities. They are turned away. Police set up an encampment on the land of the community of Cruzton to protect gold explorers. Threats and confrontations in the communities continue. The National and International Caravan for Observation and Solidarity, composed of over 300 national and international human rights promoters, visits many of the threatened communities in Chiapas. Disputes at Agua Azul are continuing. Mexico’s Energy Secretary announces oil drilling is to start in the Lacandon Jungle, and a new ‘bio-diesel’ plant is to be built in Chiapas. From 26th December to 6th January, the Worldwide Festival of Dignified Rage (Digna Rabia) takes place in Mexico City and Chiapas. The theme is “Another World, Another Politics”, and many thousands attend. Military movements and flyovers are reported and military presence is said to be increasing. The Zapatistas hold a festival in Oventic on International Women’s Day, in honour of Mama Corral; thousands attend. Resistance to the highway from San Cristóbal to Palenque is beginning, while at the same time, repression is worsening in the area of the Agua Azul waterfalls. Eight Other Campaign members from the community of San Sebastian Bachajon are imprisoned. A campaign is set up in Chicomuselo, Chiapas to struggle against the Canadian-owned Blackfire barite mine there. The First American Continental Gathering against Impunity is held in the Caracol of Morelia. The World Tourist Organisation meets in Chiapas and announces plans for a major tourist development Chiapas 2015. The Other Campaign prisoners from San Sebastián Bachajón are freed. A member of the community of Mitzitón, Other Campaign adherents also opposing the new road, is run over and killed by a truck driven by an evangelical paramilitary group based in the community, as part of a constant campaign of threats, attacks and harassment. The first group of paramilitaries who committed the Acteal massacre are freed. The message is one of impunity. Attacks on and harassment of journalists, human rights defenders and non-Zapatista communities increase. The leader of the campaign against the mine in Chicomuselo is murdered. Intensification of the campaign of press disinformation – one says the Zapatistas are planning a new armed uprising, while another says they are surrendering! More people convicted of participating in the Acteal Massacre are freed. More ‘bullets of silver’ are offered – financial and material incentives to tempt people in the communities to leave the Zapatista movement. The Zapatista caracoles are closed for the New Year celebrations for the first time. An international seminar in honour if Andrés Aubry is held in San Cristóbal, packed with Zapatista supporters. Two communities in the Montes Azules are violently evicted. More are at risk. The Caracol of La Realidad says they will defend their land. Major conflicts break out Mitzitón and Bolon Ajaw, both communities in resistance to the government road, who are threatened by paramilitary groups. There is an intensification of paramilitary activity and land conflicts. The government’s press disinformation campaign is focussing on foreign human rights observers, and on linking the EZLN with terrorism. The paramilitary group Army of God – Eagle Wings threatens the Other Campaign adherents in Mitzitón: “we are going to commit a worse massacre than that of Acteal”. A European support caravan visits threatened communities in Chiapas. Paramilitary activity and land invasions continue. A European support caravan visits all five Caracoles. A series of press conferences are held, and an extensive series of reports, audios and videos are produced on the subject of Zapatista resistance and autonomy. 170 Zapatista supporters are displaced from the community of San Marcos Avilés, municipality of Chilon, by political party members, because the Zapatistas have built their own autonomous school. Aggression by the ‘Army of God – Eagle Wings’ continues in Mitzitón. The evicted villagers return to San Marcos Avilés, but repression against them continues. Zapatistas are attacked and shot at at Agua Clara. An increase in attacks on human rights defenders is reported. The Zapatistas are accused in some of the Mexican press of having kidnapped Diego Fernandez de Cevallos. A denial is issued by Enlace Zapatista. The death of Samuel Ruíz García, Bishop Emeritus of the Catholic Diocese of San Cristóbal de las Casas, is announced on 24th January. The EZLN break nearly 2 years of silence with a communiqué honouring him. The first part of a series of letters between Marcos and the philosopher Luis Villoro, ‘on ethics and politics’, is released. 117 Other Campaign members are arrested in San Sebastián Bachajón during the ongoing dispute over the tollbooth at the entrance to the waterfalls at Agua Azul, an area where a huge international luxury tourist development is planned. 10 remain detained, accused of murder and other serious crimes. An international campaign mobilised by Movement for Justice in el Barrio in New York starts to organise actions in their support. Five of the prisoners are freed. NGOs denounce the forest programme against climate change (REDD) now operating in Chiapas, saying that it represents a threat to the indigenous peoples who live there. For example, health services have been withdrawn from the community of Amador Hernandez. More worldwide actions take place in support of the prisoners of Bachajón, who have, in effect, been offered their freedom if they give up their land. La Jornada reports that the state government is offering large amounts of money to anyone who deserts from the EZLN. In response, the Caracoles have tightened their security measures. President Felipe Calderón inaugurates the second “Sustainable Rural City” at Santiago el Pinar, close to Oventic. The Mexican army announce the creation of two new military bases on the Chiapas/Guatemala border, part of the increasing militarisation of the area. La Jornada reports 63 actions in 22 countries take place in support of Bachajón. The EZLN issue a communiqué calling on their supporters to participate in the march convoked by Javier Sicilia against the war and the bloodshed. A worldwide declaration in support of the prisoners of San Sebastián Bachajón, signed by a large number of organisations and individuals, is released, demanding compliance with international law (ILO 169) regarding respect for indigenous territory, release of the 5 prisoners, and the withdrawal of the police and military from the community. On 7th May more than 20,000 masked Zapatistas, including 30 commanders, along with members of the Other Campaign and civil society, march in silence through the streets of San Cristóbal in solidarity with the National March for Peace with Justice and Dignity. This is the first time they have made an appearance outside their territory for five years, and shows the world that they never went away. The EZLN announce their support for the Peace Caravan to Ciudad Juarez. Javier Sicilia calls the Zapatistas “a great moral force”. Families residing in the first “Sustainable Rural City” in the world, Nuevo Juan de Grijalva, denounce police persecution and harassment in response to peaceful protests. Eight members of the community and their lawyer are released following 2 months’ imprisonment. According to a series of articles in La Jornada, an agreement has been reached for the construction of a “hotel complex” at Lake Miramar, located in the Montes Azules Biosphere Reserve. Frayba warns of another possible forced displacement in San Marcos Avilés. The aggressions and threats have started again and extended to peace camp observers. Orcao kidnaps 2 Zapatista support bases, after weeks of harassment and provocation against Zapatista communities, in Primero de Enero autonomous municipality. Mexican president Felipe Calderón had planned to launch the federal government’s new tourist plan, Mundo Maya 2012, on the day of the summer solstice at the Maya archaeological site of Toniná. However, the visit is cancelled after the discovery that Zapatista signs and a big banner have been put up near the site announcing that it is Zapatista territory. The location is changed to the Museum of Anthropology in Mexico City. The five prisoners from San Sebastián Bachajón are finally freed. There are more problems with Orcao in the communities of Nuevo Paraiso and Nuevo Rosario. The pattern of land invasions, destruction of crops, burning, firing shots, damage to homes and belongings, threats and provocations continues, this month in the three Caracoles of La Realidad, La Garrucha and Morelia. The 3rd Letter from Marcos to Luis Villoro on Ethics and Politics, ‘Perhaps’, is published. More than 100 paramilitaries encircle the Zapatista Community of San Patricio in the Caracol of Robert Barrios threatening to evict and massacre everyone. Over 100 paramilitaries arrive at the community of Nuevo Purisima, La Garrucha Caracol, to take back the Zapatista lands. The Movement for Peace with Justice and Dignity’s caravan travels through Chiapas. A small group of members enter Oventic and meet with the Good Government Junta. A complaint is filed in the US against Zedillo for the Acteal Massacre. Las Abejas assert clearly that it has not come from them. 11 political prisoners, members of organizations belonging to the Other Campaign, start a hunger strike and fast at state prisons in Chiapas. There are now 13 political prisoners on hunger strike and fast. Their families set up an encampment (occupation) on the main plaza in San Cristóbal. Two prisoners from Mitzitón community are released. Expressions of solidarity come from all over the world, but Alberto Patishtán, spokesperson for the fasting prisoners, is transferred to a high security federal prison in Guasave, Sinaloa. The World Summit of Adventure Tourism is held in San Cristóbal, just next to the camp of the prisoners’ families. Frayba and the Movement for Justice in el Barrio circulate for signature a worldwide declaration in support of the Zapatista support bases in the besieged community of San Marcos Avilés, and an Urgent Action letter to Felipe Calderón regarding the rapidly deteriorating situation in Chiapas. The 28th anniversary of the EZLN. The hunger strike of the prisoners is called off, without resolution. The severely disabled child of two of the prisoners on hunger strike is refused medical treatment and dies. The 4th and last letter from Marcos to Luis Villoro is published. An international seminar of reflection and analysis “Planet Earth: Anti-Systemic Movements” is held at Cideci. The seminar celebrates the 18th anniversary of the Zapatista Uprising, and the speakers reflect on how much we all owe to the Zapatistas, and consider how they have influenced many rebellions, including the Occupy movement. 50 armed PRI supporters attack four families sympathetic to the Zapatistas in the ejido Banavil, municipality of Tenejapa. One member of the PRI is killed, a man is disappeared, several people are injured, and Francisco Sántiz López, a civilian Zapatista support base, who was not present at the scene of the crime when it happened, is detained and imprisoned. Frayba issue an Urgent Action about the Zapatista prisoner from Banavil, Francisco Sántiz López. Another seven men convicted of murder and other crimes in the Acteal Massacre are released from prison and found innocent. A judge orders Alberto Patishtán’s return to Chiapas from the prison in Sinaloa where he was arbitrarily transferred, but the federal government intervenes. Francisco Sántiz López, is released from prison but immediately re-arrested on a federal charge. Three more communities within the Montes Azules Biosphere Reserve are threatened with eviction. More than 1,000 people gather in Alberto Patishtán’s community, El Bosque, to demand his release and his return to Chiapas. A national and international campaign “Bringing Down the Prison Walls” is launched by MJB to win freedom for the political prisoners Alberto Patishtán Gómez and Francisco Sántiz López. The JBG of La Garrucha denounces attacks on the Zapatista community of Nueva Paraiso by neighbouring communities affiliated with local politicians. The attacks include land invasions, armed attacks, destruction of forests and cropland, and stealing crops. Damages are estimated at 400,000 pesos (over £20,000). The Junta accuses local, state and federal authorities of organizing the attacks. The ejidatarios of San Sebastián Bachajón denounce continual harassment and the imprisonment of three people. They believe this is due to their opposition to plans for tourist development. The Permanent Peoples’ Tribunal holds its first hearing on the Acteal massacre. On May 19th a national and international day is held in solidarity with the Zapatistas and against the continual actions of repression directed at their continuing advance towards autonomy. Movement for Justice in el Barrio convokes a week of worldwide struggle in support of the political prisoners Alberto Patishtán and Francisco Sántiz López, from 15 to 22 May, with the support of the JBG from Oventic. An enormous rally is held in El Bosque, letters are written, and actions in support are organised in countries all over the world. The JBG of Morelia denounces more land grabs, attacks and harassment by ORCAO, with the support of the three levels of the bad government, in Patria Nueva and El Nantze. As part of continuing harassment, two residents of San Sebastián Bachajón are attacked by members of UCIAF with guns, one is seriously injured. MJB convokes a “Second Week of Worldwide Struggle for the Liberation of Patishtán and Sántiz López”. Actions take place in many countries. Don Juan Chávez Alonso dies. The 12 Zapatista Community Radio stations complete their first year of broadcasting. Adherents to the Other Campaign from San Sebastián Bachajón recover the toll booth to the waterfalls of Agua Azul. They are subsequently evicted by 12 truckloads of police. A report issued by Frayba shows that torture has been institutionalised in Chiapas as a means of social control. Alberto Patishtán Gómez is returned to a Chiapas prison after nine months in Sinaloa. The Worldwide Declaration for the Liberation of Alberto Patishtán Gómez and Francisco Sántiz López is released as part of the third phase of the campaign in their support. An urgent video message from The Zapatista support bases of San Marcos Avilés is released, calling for solidarity. It is feared that they are at risk of imminent displacement. The international campaign “Worldwide Echo in Support of the Zapatistas” is convoked by MJB, to call for freedom and justice for San Marcos Avilés and Francisco Sántiz López. A caravan leaves Tila for Mexico City, where a decision is expected about the legal possession of the ejido’s land. A further nine days of action in support of Patishtán and Sántiz López is announced. A Brigade of Observation and Solidarity with the Zapatista communities is organised. The situation in San Marcos Avilés deteriorates and the campaign intensifies. A Worldwide Declaration is launched. No decision is made on the case of Tila. The JBG from Morelia denounces that the community of Moisés Gandhi is suffering violent attacks and threats of forced displacement from the Regional Coffee Growers Organization of Ocosingo (Orcao). The JBG from La Realidad denounces an attack on the Zapatista coffee warehouse near the San Carlos Ejido by members of two political parties. Armed paramilitaries from Paz y Justicia attack and displace 83 Zapatistas from Nuevo Poblado Comandante Abel and Unión Hidalgo, in Roberto Barrios Caracol. Many of the displaced become seriously ill as a result. They take refuge in nearby communities. It is reported that Alberto Patishtán is almost blind due to medical neglect. He is found to have a brain tumour. The Echo Campaign is expanded to include the communities of Comandante Abel, Unión Hidalgo, and Moisés Gandhi. Francisco Santiz Lopez spends his 300th day in prison. An escalation of paramilitary activity against the Zapatistas is denounced. Mexico’s Supreme Court agrees to take Patishtán’s case. Las Abejas denounce the reactivation of paramilitary groups in Chenalhó and the northern zone. The Worldwide Declaration in support of the Zapatistas is presented at the Mexican Embassy in London. Patishtán has surgery to remove a brain tumour. The JBG of La Realidad denounces provocations against the Zapatistas of Guadalupe Los Altos, 6 of whom remain imprisoned on ridiculous charges. The JBG of Oventic denounces attacks on Zapatista support bases in Jechvó, who have been violently deprived of their water supply. The siege of Comandante Abel and Union Hidalgo by paramilitaries continues. The expected legal resolution regarding the land of San Sebastián Bachajón is not given. The Zapatistas celebrate their 29th anniversary. The Echo Campaign, the largest campaign so far in support of the Zapatistas, comes to an end with more protests and delivery of letters to embassies and consulates. A Zapatista craft shop is set up near the archaeological site of Toniná. The JBG of La Realidad denounces that 4 brothers, 2 of them Zapatistas, have been in prison since June in Motozintla, and that there has been an attempted land grab in Che Guevara community. The JBG of La Garrucha denounces that an arrest warrant has been issued against a Zapatista for opening a craft shop on his land at Toniná, and that the archaeological site has been damaged by its director and the municipal president of Ocosingo. The announcement that their word is coming soon reappears on the EZLN website. The imprisoned brothers from Motozintla are freed, and the Toniná arrest warrants are withdrawn. On the 21st December 2012, the day when one great cycle of Maya time comes to an end and another starts, for which dire ‘end of the world’ predictions had been made in the western world, well over 40,000 Zapatista support bases peacefully and silently occupy the central plazas of the cities of Ocosingo, San Cristóbal de las Casas, Las Margaritas, Altamirano and Palenque. It is their largest mobilisation since 1994. It is known as the ‘March of Silence’. The Third International Seminar of Reflection and Analysis “Planet Earth: anti-systemic movements” is held in Chiapas. The EZLN release a new communiqué about their next steps. The release of communiqués from the CCRI-CG of the EZLN continues. They announce the end of the Other Campaign; from now on there will only be adherents to the Sixth Declaration of the Lacandón Jungle (La Sexta). They extend an invitation to celebrate the 10th anniversary of the birth of the Good Government Juntas with the Zapatista communities. New President Enrique Peña Nieto launches the “National Crusade against Hunger” in Las Margaritas, Chiapas. It is immediately discredited by the Zapatistas. Zapatista prisoner Francisco Sántiz López is released amidst celebrations. The case of the common lands of San Sebastián Bachajón is still not resolved. A federal judge denies the protective order (amparo) they requested nearly two years previously, which would grant protection to the common use lands taken away by the government. Frayba issues an Urgent Action regarding the threat of imminent eviction of Zapatista families living in San Marcos Avilés. Political party members in the ejido have asked the municipal government to evict the Zapatistas for failing to pay a property tax. A “profound humanitarian crisis” involving 7 displaced Tzeltal families from the Busiljá ejido is denounced by 9 human rights organisations. The 3 month series of communiqués (a total of 28) comes to an end. Details of the Little Schools of Freedom, to take place in August, are released, and invitations are sent out. Mexico’s Supreme Court denies Alberto Patishtán’s appeal. An international campaign is launched demanding his freedom. A week later, the Supreme Court releases another man convicted of participation in the Acteal massacre. Juan Vázquez Guzmán, ex Secretary General of the adherents to the EZLN’s Sixth Declaration of the Lacandón Jungle from San Sebastián Bachajón, is assassinated on Wednesday 24th April. As he was a leader in the struggle for the defence of his land, territory and people, this is widely regarded as a political assassination. Mexico’s Supreme Court releases another 15 of the men accused and convicted in the Acteal Massacre. Of the original 87 who were convicted, only 6 remain in prison. Threats of forced eviction continue in San Marcos Avilés. The Network for Peace in Chiapas conducts a Civil Mission of Observation and Documentation to the community, which is threatened by “political party members”. The mission reports that the situation of food shortage, constant and widespread violence, death threats, humiliations, thefts, psychological terror and continual violations of personal integrity is extremely serious. Frayba reports that the 13 displaced EZLN sympathizers from the community of Banavil remain in a precarious and inhuman situation. La Jornada reports an “avalanche of demonstrations of support following the assassination of Juan Vázquez Guzmán”. A communique from San Sebastián Bachajón reveals that the rejection of their amparo has been declared illegal. A group of ejidatarios travels to Mexico City to put their case before the Council of the Federal Judiciary, the United Nations High Commissioner for Human Rights, and the Inter-American Commission on Human Rights. A Week of Worldwide Action is convoked by a group of organisations to coincide with Juan Vázquez Guzmán’s birthday, in order to honour him, and to offer solidarity to the Adherents to the Sixth from Bachajón. Indigenous Organizations and the EZLN create the Traveling Seminar: “Tata Juan Chávez Alonso” in memory of the indigenous leader, and propose the re-launching of the Indigenous National Congress in Mexico. The first session of the seminar will be held in August. Subcomandante Moisés reveals that 1500 students have already registered for the “Little Zapatista Schools,” or Escuelitas, which are now full. A further session will take place in December/January. The Week of Worldwide Action: “Juan Vázquez Guzmán lives! The Bachajón struggle continues!” is launched on June 25th. Acts of solidarity take place in all 5 continents, and many messages of support are sent. Miguel Vazquez Deara, prisoner from San Sebastián Bachajon, is freed on June 26th. Ejidatarios of Bachajón operate a road block on the road from Ocosingo to Palenque. Nine indigenous political prisoners, adherents to the Sexta, are released in Chiapas. Renewed violence is reported in ejido Puebla, municipality of Chenalhó, triggered by the release of the paramilitaries convicted for the Acteal Massacre. The victims of the violence include Zapatistas, members of Catholic groups, and Baptists. The EZLN and the CNI issue a joint communiqué in support of the Yaqui tribe’s defence of their water. The 10th anniversary of the Good Government Juntas, and of Zapatista autonomy, is celebrated in all 5 Caracoles on 9th August. From August 12 to 16, 1700 students from all over the world attend the Escuelitas, to learn about Freedom According to the Zapatistas. The Indigenous National Congress is re-launched at the Seminar “Tata Juan Chávez Alonso”, held in San Cristóbal de las Casas. A group of evangelicals kidnap and abuse the priest of Chenalhó for eight hours in the ejido Puebla. A caravan of Alberto Patishtán’s supporters goes from Mexico City to Chiapas. San Sebastián Bachajón’s appeal to restore the land confiscated 2 years ago by the state government is denied. They take their case to the Supreme Court of Justice of the Nation. 98 people (17 families) are displaced by acts of violence from the ejido Puebla. They take refuge in Acteal. Las Abejas warn of the risk of a massacre. The motion for the recognition of the innocence of Alberto Patishtán is denied, and he remains in prison. Further alternatives are being investigated. Civil society awards him its recognition of innocence. Following an amendment to the federal criminal code, President Enrique Peña Nieto pardons Alberto Patishtán, who is released on 31stOctober after 13 years of unjust imprisonment for a crime he did not commit. The Good Government Junta of La Realidad denounces that various local government officials have been trying to dispossess the Zapatistas who live in the community of Che Guevara, near the Guatemalan border, through numerous provocations, and that on October 26 they started to construct a house on Che Guevara’s recuperated land. The Good Government Junta of Morelia denounces land invasions, aggressions and death threats in the ejido 10 de Abril, in the 17th of November autonomous municipality, from members of CIOAC-Historical from a nearby community. The JBG of La Garrucha denounces the judicial harassment of a Zapatista for cutting down a small tree, and the harassment against independent truckers in Ocosingo. The ejidatarios of San Sebastián Bachajón denounce that a violent eviction from their gravel quarry is being organised by government-supporting local officials. But there is good news for the ejido – their amparo, regarding land from which they were dispossessed by the government, is restored by the federal appeals court, overturning a previous decision. The EZLN announce that places (raised again to 2,500 for each session) are now full for the December and January Escuelitas. A fourth session is to be arranged. Alberto Patishtán Returns to Chiapas. Miguel Demeza and Antonio Estrada from San Sebastián Bachajón, both unjustly imprisoned for crimes they did not commit, are released from prison in Chiapas. The Permanent Peoples Tribunal holds hearings in Susuclumil, a Chol community in Tila municipality, to take testimony from witnesses, survivors and relatives, all victims of the “dirty war” (counterinsurgency or “low-intensity” war) in Chiapas against the EZLN. Prior to the 20th anniversary of the uprising, a huge media smear campaign is launched, saying that the Zapatistas are worse off today than they were 20 years ago, that they are destroying the environment and dividing communities. This is quickly countered by many recent students of the Escuelita. The second session of the escuelita takes place prior to the anniversary celebrations in the Caracoles. The Zapatistas celebrate their twentieth anniversary in all 5 caracoles. The third session of the Escuelita follows the celebrations. Altogether around 5,000 students attend both sessions. Los Llanos, a Tzotzil community in the rural part of San Cristóbal municipality, files for an amparo against the construction of the San Cristóbal-Palenque Toll Road. The court issues a temporary order to halt the work until there is a decision on the case. Ejidatarios from San Sebastián Bachajón denounce another attempt to take their land through falsification of documents. They inform that the released prisoner Antonio Estrada Estrada still has to return weekly to the court to sign in. The 98 people displaced from the ejido Puebla return home temporarily to harvest their coffee. The ejido Tila obtains a court order suspending work on the construction of a commercial centre on their land. On 27 and 30 January two serious attacks are made on the Zapatista community of 10 de Abril by CIOAC-Democratic. Medical personnel from the San Carlos Hospital in Altamirano are also attacked and prevented from assisting the wounded. The Network for Solidarity and Against Repression launches a Week of National and International Solidarity “If they touch the Zapatistas, they touch all of us” in support of 10 de Abril. Statements of support are issued and activities take place in many corners of the world. The Tzotzil community of San José El Porvenir also announces its opposition to the San Cristóbal-Palenque Toll Road. The Palenque International Airport is inaugurated. The people displaced from ejido Puebla return to Acteal; safe conditions for them to return to their homes have not yet been achieved. Juan Carlos Gómez Silvano, aged 22, a co-ordinator of the adherents to the EZLN’s Sixth Declaration in the ejido San Sebastián Bachajón, is ambushed and murdered. This is the second assassination in Bachajón in less than a year. The EZLN announce forthcoming events for May and June: an exchange with the native peoples, a homage to the philosopher Luis Villoro, and a week-long seminar on “Ethics in the Face of Dispossession”, when future steps for the Sixth are to be announced. Frayba celebrates its 25th anniversary of “walking with the peoples”. Violence continues in the ejido Puebla, and a family home is burned down. The Zapatistas release the second issue of their new magazine, Rebeldía Zapatista. A homage is held in the ejido San Sebastián Bachajón for Juan Vázquez Guzmán, assassinated on April 24, 2013, and Juan Carlos Gómez Silvano, assassinated on March 21, 2014. This homage is supported by an International Campaign of two weeks of worldwide action “Juan Vázquez Guzmán lives. The Bachajon struggle continues!” held in solidarity with San Sebastián Bachajón. Films are screened, many actions are held and statements of support issued. The 17 displaced Catholic families return to their homes in the ejido Puebla “without justice”. On May 2, members of CIOAC-Historic, and the PVEM and PAN political parties attack Zapatista support bases in the Caracol of La Realidad. They destroy the autonomous school and health clinic, cut off the water supply, injure 15 Zapatistas, and brutally and intentionally murder compañero Votán Galeano in a planned and premeditated paramilitary attack. All the planned future events are cancelled, and the JBG turns the matter over to the EZLN high command. Letters of support are sent from around the world, and an international call to action is issued from the United States, which receives a worldwide response. May 18 is the international day of protest. On May 24 the homage is held for Galeano in La Realidad, attended by a huge number of Zapatista support bases and adherents to the Sexta. Subcomandante Marcos announces that from that moment onwards he will cease to exist. He will now be known as Subcomandante Galeano, so that Galeano will not die. The indigenous Subcomandante Moisés is now the spokesperson and public face of the EZLN. A Peace Camp is set up by Frayba in La Realidad. Donations start to arrive for rebuilding the autonomous school and clinic. Primero de Agosto, a pro-Zapatista Tojolabal community in the same area denounces further attacks by CIOAC-H and another group called ASSI, including provocations, threats, attempted murders, robbery and a land invasion. NGOs report that militarization has increased in Chiapas municipalities along the border with Guatemala, allegedly designed to deter drug trafficking from Central America into Mexico. Subcomandante Moisés reports that fundraising for rebuilding the autonomous school and clinic in La Realidad has yielded almost 5 times the estimated cost of the construction materials. They will use additional funds to buy equipment and supplies for the school and clinic. Moisés also announces that an “exchange” between the Zapatistas and the National Indigenous Congress (CNI) will take place in La Realidad between 4th and 8th August. He asks for solidarity to house and transport CNI members. The “exchange” or “sharing,” which was delayed by the paramilitary attack and the murder of Galeano, takes place. This is followed by a report, the issue of two Declarations, and a meeting with the free and independent media. Armed members of ORCAO threaten to attack Zapatista support bases (BAZ) in the communities of El Rosario, Egipto, San Jacinto and Kexil in the municipality of San Manuel, caracol of La Garrucha. The aggressions started at the end of July, and escalate in August. As a result, 72 BAZ are displaced. The EZLN and CNI announce the “Worldwide Festival of Resistance and Rebellion against Capitalism” with the slogan “while those of above destroy, those from below construct.” This big worldwide sharing will be held between December 22, 2014 and January 3, 2015 in different locations in Mexico. A joint communiqué is released by the EZLN and CNI demanding the freedom of the Yaqui spokesperson Mario Luna, who has been arrested as part of the repression against the Yaqui struggle for their right to water. The proposed route for the San Cristóbal-Palenque Super-Highway is now public, and there is resistance and opposition to its construction from large numbers of indigenous peoples who hold large gatherings and marches. Three adherents to the Sexta from San Sebastián Bachajón are arrested on false charges, tortured to make them confess, and imprisoned. On September 26, in Iguala, Guerrero, municipal police kill 6 people including 3 students from the Ayotzinapa Normal School, disappearing 43 more students. The Zapatistas issue a communiqué expressing solidarity with the Ayotzinapa students, announcing that its members will participate silently in marches to be held throughout the country on 8th October, and urging adherents to the Sixth Declaration to mobilise for this. 20,000 Zapatistas march silently in Chiapas. In a second communiqué the EZLN announce they will participate in the national and international actions on 22nd October in support of the Ayotzinapa students, and the Yaqui prisoners. Thousands of Zapatistas participate by lighting candles in their communities and on local roads, demanding the safe return of the 43 Ayotzinapa students, and the freedom of the 2 Yaqui prisoners, Mario Luna and Francisco Jiménez. The EZLN and the CNI issue a strong joint statement on Ayotzinapa, accusing the bad governments of disappearing the students and of being a narco-state. The statement is also about the Yaqui political prisoners. The EZLN and the CNI issue a second joint statement, regarding a private company invading the indigenous communal lands and destroying the sacred forests of the Ñatho and Mexica in San Francisco Xochicuautla, in the state of Mexico, and about the attack and threats made against Yaqui activist Lauro Baumea. Protests continue against the dispossession of indigenous lands by the proposed super-highway between San Cristóbal and Palenque. Part of the Caravan of relatives and compañer@s of the murdered and disappeared Ayotzinapa students meets with Zapatista bases and commanders in the Caracol of Oventic. Comandantes Javier and Tacho welcome them and open the meeting and Subcomandante Moisés issues a major statement on behalf of the EZLN’s General Command. The CNI and EZLN issue a joint statement about the use of riot police and helicopters to break up a protest in Xochicuautla over the construction of a super-highway there, during which 8 indigenous members of the community are arrested. The CNI announces the schedule and registration process for the Worldwide Festival of Resistance and Rebellion against Capitalism. It will be inaugurated in Xochicuautla, and finish in Cideci. On the international day against violence towards women, more than 20,000 thousand members of Pueblo Creyente (Believing People) and the Movement in Defence of Life and Territory march against the super-highway, against the sale of alcohol and drugs and against violence against women. Three more of the paramilitaries convicted of participating in the Acteal Massacre on December 22, 1997, are released from prison, meaning that 73 of the 75 paramilitaries convicted of this crime against humanity are now free. The EZLN issue a long communiqué “On Ayotzinapa, the Festival and hysteria as a method for analysis and a guide for action,” in which the Zapatistas give up their 20 Spaces in the forthcoming Worldwide Festival of Resistances and Rebellions against Capitalism to the parents and families of the disappeared students from Ayotzinapa, making them guests of honour. Another communiqué on the eve of the festival lists the participants – from 35 native peoples and 26 countries, giving final details of the arrangements. Registration for the Festival, convoked jointly by the CNI and the EZLN, begins on 20th December, and the inauguration on the 21st, in Xochicuautla, State of Mexico. The sharing of resistances takes place over the next two days in Xochicuautla and in Amilcingo, Morelos. Early on 21st December the Tseltal ejidatarios from San Sebastián Bachajón recuperate the lands, including the toll-booth at the entrance to the Agua Azul waterfalls, which were stolen from them by the government on February 2nd, 2011. They announce the recovery of their lands during the inauguration of the festival, and call for solidarity. Frayba issues an Urgent Action about armed threats to displace the inhabitants of the community of Primero de Agosto, in the municipality of Las Margaritas, who are described as EZLN sympathisers. The aggressors are members of CIOAC-H, the same group which attacked La Realidad and murdered Compañero Galeano. Frayba says this group is protected by the municipal government of Las Margaritas. A delegation of students and parents of the disappeared from Ayotzinapa joins Las Abejas for the commemoration of the 17th anniversary of the Acteal massacre, on 22nd December. The Festival spends a few days of workshops, music and cultural activities in the Federal District, before moving to Oventic for the final sharing and the celebrations of the 21st anniversary of the Zapatista uprising. Subcomandante Moisés reads a communiqué marking the 21st anniversary of the War against Oblivion. The World Festival of Resistances and Rebellions against Capitalism concludes in Cideci. The Indigenous National Congress, the EZLN and adherents to the Sixth Declaration issue a Joint Declaration condemning capitalism and the damage it causes to Mother Earth and to her Peoples, and urging us to organise. On 9th January, more than 900 state and federal police evict the compañer@s guarding the recuperated lands of San Sebastián Bachajón. On January 11th the ejidatarios set up a roadblock on the road from Ocosingo to Palenque. The police attack them with firearms, but the ejidatarios drive back the municipal and state forces and maintain the roadblock, which they subsequently make intermittent. The Sixth International Caravan In Support Of San Sebastián Bachajón visits the community to offer support. The Tsotsil community of Mitzitón successfully files a petition for amparo (protection) against the construction of the superhighway, and calls for a suspension of the work. Members of the Pueblo Creyente go on pilgrimage in San Cristobál in memory of jTatic Samuel, opposing megaprojects like the highway and mining, and in defence of mother earth. Frayba denounces the forced displacement of 57 indigenous Tojolabales, including 12 minors, one newborn, 20 women and 25 men, residents of the community of Primero de Agosto, by members of the CIOAC-H, who are protected in the region by the municipal government of Las Margaritas. The displaced people are living in very unhealthy conditions in a camp on the side of the road, with very little food, and many of them are ill.
Frayba further denounces the serious situation of threats and attacks by the armed “Pojcol Group” against the Zapatista support bases of the community of El Rosario, Rebel Autonomous Municipality San Manuel, and threats made against the community of Nuevo Paraíso, in the official municipality of Ocosingo, both in the Caracol of La Garrucha. A national and international brigade of observation in solidarity with San Sebastián Bachajón visits the ejido in response to the serious risk of attack and displacement. Antonia Lopez Mendez, aged 11, one of 13 people who were forcibly displaced from the community of Banavil in December 2011, dies. The cause of death is said to be due to the stress, poverty, poor healthcare and malnutrition caused by the displacement. Her family are accompanied in their journey back to Banavil to bury her, with no support from the authorities; they then return in to exile. 2000 children live in forced displacement in the north and highlands of Chiapas. Felix Serdan Najera dies at the age of 98. He was aide to the late guerrilla leader Ruben Jaramillo, and an honorary major in the EZLN. Subcomandantes Moisés and Galeano release a letter they have written to his compañera, Emilia. The Pueblo Creyente from Simojovel denounce threats made by PRI members against their priest, Father Marcelo Pérez Pérez, and announce a forthcoming four-day pilgrimage for peace to Tuxtla Gutiérrez. The EZLN announce their calendar for 2015. Homages are to take place:to Luis Villoro Toranzo and to compa Galeano, on May 2nd at the caracol of Oventic, followed, on 3-9 May, by the Seminar “Critical Thought Versus the Capitalist Hydra,” beginning in Oventic and continuing in CIDECI. The second grade of the Escuelita, (only for those who passed the first grade,) will be from July 31st to August 1-2, 2015. The Fiesta for the Caracoles will be from August 8-9, in the 5 Zapatista Caracoles, and the Third Grade of the Escuelita (only for those who pass the second grade) will take place from November-December 2015. A series of three communiqués record that on March 1, 2015, after more than six months of work, the building that houses a health clinic and a school was presented to the Zapatista bases of support in La Realidad, and that it was the solidarity of people and collectives throughout the world which made this construction possible. Frayba reports that it has documented a growing number of military actions since July 2014 in the territory of the JBG of La Realidad. These consist of incursions in convoys with trucks, hummers, jeeps, and motorized equipment, with between 4 and 30 members of the Mexican Army. There are also low flyovers. SupGaleano confirms that the forthcoming homage and seminar will take place despite the increase in army patrols, checkpoints and flyovers, which are particularly taking place in the caracoles of La Realidad and Oventic. The 17 families displaced from the community of Primero de Agosto on February 24th by members of Cioac-H continue to live in precarious circumstances, without water and under sheets of plastic, on the side of the road. On 21st March more than 600 members of the public forces along with local lackeys burn down the newly built San Sebastián regional headquarters. Two members of the free media, who are there to document human rights violations, are verbally and physically assaulted. Well over 15,000 people participate in a massive four-day peaceful pilgrimage against violence from Simojovel to Tuxtla Gutiérrez, a distance of 120 kilometres. SupGaleano sends a communiqué which gives details and the link to use to register for the seminar “Critical Thought Versus the Capitalist Hydra,” to take place from 3rd to 9th May 2015. A few days later, the webpage Enlace Zapatista suffers a cyber-attack. The free media responds by reprinting the text of the communiqué and sharing the pre-registration formats for the seminar, so registration can continue. The Programme is released on 29th April, by which time 1,528 people have registered. The Pueblo Creyente of Simojovel denounce an increase in the death threats and acts of persecution and harassment against their priest, Father Marcelo Pérez, and members of the Parish Council and the Pueblo Creyente from this municipality. The forcibly displaced people (17 families) of the community Primero de Agosto report further harassment from members of the Cioac-h from the ejido Miguel Hidalgo. The villagers have now been displaced for two months, they have no water, many of them are sick, their possessions have been burned, and one of the women is about to give birth. The ejidatarios from San Sebastián Bachajón are denied their petition for amparo against the dispossession of their communal lands, which they first presented to the courts in March 2011. A Worldwide Pronouncement is released In Solidarity with the Compañer@s of San Sebastián Bachajón, with signatories from over 20 countries,. The commemoration of 2 years since the assassination of Juan Vázquez Guzmán takes place on 24th April, 2015, with a mass in the family home. A homage to compañeros Don Luis Villoro Toranzo and Zapatista teacher compañero Galeano takes place in the Caracol of Oventic on May 2nd. More than five thousand people attend. The Seminar “Critical Thought against the Capitalist Hydra” is inaugurated on May 3rd in Oventic before moving to CIDECI University of the Earth in San Cristóbal de Las Casas, where it continues until 9th May, with participation from many well-known thinkers, writers, philosophers, activists and analysts, along with the Sixth Commission of the EZLN. An in-depth analysis is shared regarding the future of capitalism and the construction of alternatives to it. 2,600 people register to participate. The JBG from La Garrucha denounces paramilitary attacks on Zapatista communities of El Rosario and Nueva Paraíso. At El Rosario shots are fired at a thirteen year old girl, after the attackers have invaded and measured the recuperated land. In Nuevo Paraíso the JBG has initiated mediation, but this has not resolved the problem. Frayba releases a new report: “La Realidad, Context of War,” highlighting new developments in counterinsurgency, with the members of CIOAC-H creating an armed “self-defence” group, allowed, encouraged and strengthened by the structure of municipal government. The Human Rights Centre considers that the Mexican government is responsible for the extrajudicial execution of Zapatista teacher Galeano and the assaults and harassment of BAEZLN. After receiving vaccinations for Tuberculosis (BCG), Rotovirus and Hepatitis B, 31 indigenous children aged under 5 from the rural mining community of La Pimienta in Simojovel municipality have adverse reactions and have to be hospitalized. Two of the babies die. 93 percent of the people in this area live in poverty, 69 percent in extreme poverty, and the tragedy highlights the lack of healthcare in the region. The Pueblo Creyente convoke a pilgrimage from Simojovel to La Pimienta in which over 2,000 people participate. On 11th and 12th May, a Civilian Observation Mission from the Network for Peace visits the indigenous Tojolabal families forcibly displaced from Primero de Agosto. Their report reveals a grave humanitarian situation, especially serious for children, and pregnant women. They are living under plastic sheets; they suffer malnutrition and acute shortage of water; they fear further attacks and consequently do not sleep. This situation is worsening, with serious consequences for the physical and emotional health of the 56 people. Immediate action for the return of the community to their homes is called for. Videos, audios and English translations of the series of talks by the EZLN at the seminar “critical thought versus the capitalist hydra” continue to be published. Alejandro Díaz Santiz, indigenous Tsotsil and adherent to the Sixth, detained in prison No. 5 in San Cristóbal de Las Casas, has his amparo for release denied; he has now spent 16 years in prison for a crime he did not commit. The caravan of family and friends of the disappeared and murdered normal school students of Ayotzinapa visits the North of Chiapas to meet with the organized indigenous communities of the Indigenous National Congress (CNI). Meetings are held in San Francisco Teopisca, Tenejapa, and in the ejido San Sebastián Bachajón, and on 18th June the Ayotzinapa families march with human rights defenders and members of X’inich in Palenque to demand justice for the disappeared students and for the victims of the Viejo Velasco massacre. 2,500 members of the Pueblo Creyente from El Bosque go on a pilgrimage to call attention to the problems they are facing, such as violence, corruption, drug trafficking, prostitution, bars selling alcohol, and lack of basic services like healthcare and drinkable water. The Pueblo Creyente of Simojovel call for solidarity and peace following new death threats and harassments being made by leaders of the PRI against Father Marcelo Perez and the catechists and members of the Parish Council. A member of Las Abejas of Acteal, Manuel López Pérez, is murdered. Members of the board of Las Abejas say they are unable to attend his burial in San Joaquin for security reasons, due to the number of paramilitaries in the area. They later denounce death threats against other members of their organisation. A new paramilitary attack is denounced by the JBG Path of the Future, Caracol of La Garrucha in the community of El Rosario, autonomous municipality of San Manuel. The JBG say that the group is financed and trained by the state, municipal and federal governments. These are the same paramilitaries who have attacked El Rosario on two previous occasions. This attack is widely denounced. The tenth anniversary of the release of the Sixth Declaration of the Lacandon Jungle is celebrated. Frayba issues an Urgent Action about the risk to the life and personal safety of the BAZ in the communities of El Rosario and Nuevo Paraíso. Many letters and pronouncements are issued denouncing the paramilitary attacks in El Rosario, and expressing solidarity with the Zapatista Support Bases. The Network for Solidarity and against Repression convokes a week of global solidarity with the Zapatista communities from 12th to 19th July. There is a large response to this call in many parts of Mexico, and also internationally in countries such as Brazil, Argentina, Germany, France and Spain. The EZLN presents the book “Critical Thought against the Capitalist Hydra” volume 1 – the Participation of the Sixth Commission in the Seminar “Critical Thought against the Capitalist Hydra,” and releases a fragment of text, “Chiapas, Mexico, the World” taken from “our view of the hydra” by Subcomandante Galeano. The CNI and EZLN issue a joint condemnation of the attack on the Indigenous Nahua municipality of Santa María Ostula, Michoacán, in which a 12 year old boy was killed and several people injured, and of the arrest of the First Commander of the community police, Cemeí Verdía Zepeda. Subcomandantes Moisés and Galeano send out information about the second level of the Escuelita Zapatisia, taking place from 31st July to 2nd August, which is for those who have passed the first level. The second level will not be held in Zapatista territory, because so many students have problems with the cost and the time needed to get there, but is to be done collectively by students in the places where they live. The CNI and EZLN issue a communique in support of the struggle of the Ñätho community of San Francisco Xochicuautla against the road project which threatens the destruction of their sacred forest. This follows the signing of a presidential decree by President Enrique Peña Nieto expropriating 37 hectares of land in order to permit the construction, of a new section of the Toluca-Naucalpan highway on the communal land of the community, slicing through the sacred Otomi-Mexica forest. Over 4,000 indigenous and mestizos from Las Margaritas and the surrounding area go on a pilgrimage against the suffering of the peoples, for peace and life and against violence and dispossession. The Network for Peace highlights the lack of response from the Chiapas state government to the case of the displaced people of Primero de Agosto. The displaced families from Banavil also call attention to their case, and later announce they will return temporarily to work their lands. The second level of the Zapatista Escuelita is now available online for students who passed the first level, which was held in Chiapas in 2013 and 2014. Groups of approved students gather to watch the video and prepare their questions. The twelfth anniversary of the birth of the Caracoles and the creation of the Good Government Juntas (JBG) is celebrated in all the Caracoles on August 8th. More presentations of the book “Critical Thought against the Capitalist Hydra” volume 1 are made. The forcibly displaced families from the community of Banavil return temporarily for a period of 15 days to work their lands, in order to be able to sustain their families. Las Abejas de Acteal call a press conference for the anniversaries of 2 months since the murder of Manuel López, which has not been investigated, and of 6 years since the release of paramilitaries responsible for the massacre. Press sources say that following the failure of the new super-highway project from San Cristobal to Palenque, due to the amount of local opposition, the federal government will invest three thousand million pesos in modernising the existing road. Three Bachajón political prisoners from the ejido San Sebastián Bachajón, Juan Antonio Gómez Silvano, Mario Aguilar Silvano and Roberto Gómez Hernández, are released from prison in Yajalón. Enlace Zapatista Launches a New Website, http://www.grieta.org.mx/ to raise awareness of the different resistances in Mexico, the word of the EZLN, the recent seminar and national issues. Frayba denounces death threats, physical attacks and harassment against support bases of the EZLN in the community of Tzakukum, official municipality of Chalchihuitán, Caracol ll, Oventic, including beatings, multiple death threats including attacks with machetes and burning with petrol, and cutting of water supplies. As has happened in other communities, the conflict began in July 2015 over the building of a school. The EZLN issues a communiqué From Pain, From Rage, For Truth, For Justice, in which they announce that on 26th September to mark the first anniversary of the disappearance of the 43 students of Ayotzinapa thousands of Zapatistas will mobilize and calling on all honest persons on the planet to do the same. Groups and communities in Chiapas, adherents to the Sixth Declaration and members of the Indigenous National Congress (CNI, its initials in Spanish), also issue communiques and participate in demonstrations in solidarity with Ayotzinapa. As expected, Peña Nieto sends a proposal to Congress to approve a law creating Special Economic Zones in Chiapas, Oaxaca and Michoacán. This is interpreted as another opportunity for dispossession, exploitation and plunder. The 57 displaced Tojolabal families from Primero de Agosto community denounce threats of a new displacement. More than 200 indigenous from Chiapas meet in Acteal, Chenalhó, Mexico, for the Forum on “The Other Justice” organized by the Civil Society Las Abejas, the X’inich Committee for the Defence of Freedom, and Peoples United in Defence of Electrical Energy (PUDEE). The Civil Society Las Abejas, together with Frayba, participate in a public audience before the Inter-American Commission on Human Rights (IACHR) in Washington, DC, regarding impunity in the case of the Acteal massacre of 22ndDecember, 1997. Evidence is brought to show that the Mexican state was responsible for the massacre. The official representative of the Mexican government rejects all responsibility for the atrocity. The 19 members of the displaced families from Banavil return temporarily to their community to make an offering, according to their customs and traditions at this time of year, at the graves of Antonia López Méndez and 2 of her sisters. The families are accompanied by a caravan of human rights observers and national and international individuals and organisations in solidarity. Adherents to the Sexta in the community of Shulvó, in the autonomous municipality Vicente Guerrero, or Zinacantan, are intimidated by a group of PRI members and the Federal Electricity Commission who cut off their water, electricity and telephone. On the third anniversary of his death, the Civil Society Las Abejas de Acteal commemorates Manuel Vázquez Luna (Manuelito), who died due to medical negligence. His parents, sisters, grandmother, and uncle were all killed by paramilitaries on 22nd December 1997. Members of the organization XINICH begin the first of 13 Sundays of prayer and fasting in their communities in commemoration of the ninth anniversary of the Viejo Velasco massacre. The Mexican State recognizes its responsibility for the execution of 3 Zapatista support bases in the Ejido Morelia on 7th January 1994, and makes a public apology to their families. This admission does not represent punishment of those responsible. The governor of Chiapas, Manuel Velasco Coello, visits Acteal and distributes items such as lambs and chemical fertilisers to members of political parties and paramilitary groups living there. Las Abejas de Acteal denounce the visit as a deceitful trick to gain control of the people. Ejido authorities from the Ejido Tila, in the northern zone of Chiapas, report a far-reaching paramilitary, military and police operation in their territory, and repeat their demand for the municipal government headquarters to be re-located outside the ejido. On 17th November, the EZLN celebrates their 32nd anniversary. Luis Villoro’s last book, Alternative: Perspectives and Possibilities for Change, which includes correspondence with the then Subcomandante Marcos, is presented at Cideci by representatives of Villoro’s family and friends including Comandante David of the EZLN, accompanied by Comandantas Yolanda and Florencia. On the 20th, 21st and 22nd November an Encuentro is held in Barcelona attended by representatives of Zapatista support groups from many parts of Europe. On 25th November, the international day against violence against women, the Movement in Defence of Life and Territory holds a pilgrimage against megaprojects in 11 municipalities in Chiapas to make visible the situation of dispossession and plunder they are experiencing as indigenous peoples; and especially to denounce the violence experienced by women. Las Abejas of Acteal denounce an ambush and armed attack on members of their organisation, as well as threats and harassment. There are protests at the lack of follow-up to the deaths of 29 babies due to medical negligence in the community of La Pimienta, Simojovel. A press conference is called to mark the fourth anniversary of the forced displacement forced disappearance of people in Banavil, Tenejapa. The perpetrators continue in impunity. The community of San Francisco, Teopisca, celebrate the tenth anniversary of the recuperation of their lands. Thousands of people march in San Cristobal de Las Casas and participate in the public proclamation of the new Popular Citizens’ Constitutional Power. More municipalities declare their territory free of mining and dams. A group of PRI members led by the municipal president of Zinacantan attack and shoot at adherents to the Sexta in the community of Shulvo, and cause damage to several houses. The attack leads to a forced displacement from the community. ‘National and International Days for our Prisoners’ are held, in solidarity with political prisoners in Mexico and the world who are adherents to the Sexta or the equivalent. Ch’ol ejidatarios of Tila, adherents to the Sexta, recover their ejidal lands which have been occupied for the last fifty years by the municipal presidency and city hall. They subsequently denounce the reactivation of paramilitary groups, and a declaration “Facing the Gathering Storm” is issued in solidarity by the Indigenous National Congress. José Alfonso Cruz Espinosa, Zapatista support base from Toniná, is arrested again on fabricated charges of ecocide and plunder, an act which took place in 2012. José has been targeted because he owns the land at the foot of the classic Maya pyramid in Toniná. Indigenous Tsotsil adherents to the Sexta from the community of San Isidro Los Laureles, municipality of Venustiano Carranza, announce that they have recuperated between 165 and 200 hectares of their land and territory from large cattle and sugar cane ranches, where their parents and grandparents had worked as indentured servants since 1940. The 18th anniversary of the Acteal Massacre is marked on 22nd December with a commemoration and pilgrimage. Leaders and members of the CIOAC-H threaten and intimidate the displaced people from Primero de Agosto. It is announced that the visit of Pope Francis to Mexico in 2016 will include Chiapas, where he will hold a mass with indigenous communities, and visit the tomb of bishop Samuel Ruiz García, who died in 2011. Events in the ejido Tila and the municipality of Chenalhό demonstrate the reactivation of paramilitary groups, primarily Paz y Justicia, in the north of Chiapas, the Tseltal and Chol region. Frayba denounces intimidation and raids on collaborators with Cideci and a member of the support team of the EZLN Sixth Commission. Ejidatarios adherents to the Sexta from San Sebastián Bachajón organise a roadblock and issue a communiqué in solidarity with the ejido Tila and to demand respect for the rights of the indigenous people of both communities. Presentations of the book “Critical Thought against the Capitalist Hydra, volume one” continue. The book is being translated into Italian, French, German and English. The ejidatarios of San Sebastian Bachajón issue a communiqué in solidarity with Las Abejas, and the Ejido Tila releases one of solidarity with other adherents to the Sixth, against paramilitary actions and repression. Members of the the Tsotsil community of San Isidro Los Laureles, municipality of Venustiano Carranza, denounce a threat of eviction from their reclaimed lands, fearing a repeat of the violent eviction of 1994. Paramilitary activity is reported again in Ejido Tila, where “a small cell of paramilitary groups has been organizing inside” their ejido. The 6th of January 2016 represents the tenth anniversary of the Death of Comandanta Ramona, “the smallest of the small”. Members of CIOAC-H fire shots at the displaced Tojolabal families from Primero de Agosto, described as “EZLN sympathisers.”. Conflict breaks out in Oxchuc over the results of the mayoral elections, and against the political bosses [caciques) who dominate many Chiapas municipalities, against the will of the majority of the people living there. A possible reactivation of mining in Chicomuselo is denounced. The federal government has granted concessions to companies such as Blackfire, without prior consultation or consent, and without informing the residents of the communities. Frayba opens a photographic exhibition in San Cristobal in support of displaced people. Authorities of the Otomí-Ňätho indigenous community of San Francisco Xochicuautla, located in Mexico State, along with members of the Indigenous Peoples’ Front in Defence of Mother Earth, express their solidarity with the indigenous peoples of Chiapas in resistance against dispossession. Ejidatarios from the community of La Pimienta, municipality of Simojovel, denounce the failure of the federal and state government to provide the medical services promised after the death of 2 babies and the serious illness of 29. The Latin American Network of Sites of Memory announces its concerns and condemns the acts of persecution and murder against members of civil society organization Las Abejas of Acteal, and the revival of the paramilitary group known as Peace and Justice. Around one hundred armed members of CIOAC-h attack the ejido November 20, in the municipality of Las Margaritas, leaving one person killed and ten seriously wounded. The group has attacked various groups and organizations in the border area, including the EZLN. A meeting for the defence of land and territory against dams and mining takes place in Tonalá to share experiences and define a common defence strategy against the increase in mining, dams and other infrastructure projects being imposed without the people being consulted. To mark the fifth anniversary of the death of jTatik Samuel Ruiz García, several thousand members of the Pueblo Creyente from different parishes in the area make a pilgrimage in in defence of their human rights and of the mother earth. Frayba reports that, 15 years after the event, the Mexican state has made an act of public apology, and signed an agreement to pay damages to families from the community of El Aguaje, located in Rancho Nuevo in the municipality of San Cristobal de Las Casas, who have been the victim of violations of their human rights. Pope Francis comes to Chiapas as part of his visit to Mexico. He celebrates mass in front of thousands of indigenous people in San Cristobal, announces a decree formally authorising the performance of liturgical ceremonies in indigenous languages, and asks the indigenous population for forgiveness (pardon) for the exclusion they have suffered for more than 500 years. Over 120 people from indigenous nations and organizations gather in San Cristóbal to discuss Pope Francis’ second encyclical, Laudato Si, together with theologians and with campesino, human rights, and environmental groups from 17 countries. Figures show that currently more than 200,000 people in Mexico are living in forced displacement through violence. Of these, over 30,000 are in Chiapas. The displaced indigenous Tsotsil people from the community of Shulvó, Zinacantán, in the autonomous municipality Vicente Guerrero, adherents to the Sixth Declaration, set up an encampment in the Plaza beside the cathedral in San Cristóbal. They denounce that they are being criminalised for being supporters of the EZLN, and demand conditions for the return home of the 47 people from 9 families who have been displaced from Shulvó. The Tojolabal community of Primero de Agosto has now been displaced for one year. María Fernanda Méndez Pérez, born prematurely in the temporary encampment last October, dies on 7th February at the age of four months, as a result of the conditions of vulnerability resulting from the displacement, government neglect and medical negligence. February also marks the first anniversary of the death of another child victim of forced displacement, the Tseltal Antonia López Méndez from Banavil, who died at the age of eleven. Her family return temporarily to their community of Banavil, accompanied by a solidarity caravan, to remember her. 16th February 2016 marks twenty years since the signing of the subsequently betrayed San Andres Accords by the federal government and the EZLN. Thousands of ejidatarios from Tila march to show the general will of the people for self-government and self-determination and against government repression, following an attempted police operation and outstanding arrest warrants against 20 individuals. The Ministry of Tourism confirms the relaunch of the megaproject for the construction of the San Cristobal-Palenque highway. Communities in Chiapas are organizing to protect the sacred Suyul Lagoon and their communal lands from this planned multi-lane highway. Ejidatarios from Candelaria have travelled from community to community along the proposed highway route, leading to the formation of a united front of opposition, the Movement in Defence of Life and Territory. Ejidatarios from Chicoasen, who are defending their lands against the construction of the Chicoasen II dam, announce the release of their lawyer, who has been imprisoned for several months. Following the building of the Chicoasen I dam, the ejidatarios have an amparo against the second dam. The community of San Isidro los Laureles denounces intimidation and harassment by white guards carrying high calibre firearms. They fear another violent eviction. The Pueblo Creyente of Simijovel denounce the increase in threats and aggressions against their parish priest Father Márcelo Pérez and the poverty, violence, institutionalized corruption, impunity, alcoholism, drug trafficking and existence of narco-politics in Simojovel. Emilio Jiménez Gómez and Santiago Moreno Pérez, indigenous Tseltales from San Sebastián Bachajón unjustly imprisoned in Cereso 17 at Playas de Catazaja, Chiapas announce that their resistance and struggle continues, and call for solidarity. Two communiques from the EZLN compare advances in the Zapatista communities to the situation of the non-Zapatista communities which are affiliated with political parties. They announce to members of the Sixth and the National Indigenous Congress that activities will be convened in the coming days. 1: The Festival and Sharing Exchange “Comparte for Humanity” which will take place from the 17th to the 30th of July 2016. All those who practice ART can participate. The festival will have two major events, at CIDECI, San Cristóbal de Las Casas, and at the Caracol of Oventik. 2: The Festival in Homage to the National Indigenous Congress for its 20 years of struggle and resistance, to be held on October 12, 2016, at CIDECI. The CNI will hold its own activities before and after this. 3: To the gathering “The Zapatistas and the Consciences for Humanity” to be held from December 25, 2016 until January 4, 2017, at CIDECI. More than 70 organisations from more than 10 countries demand the freedom of Alejandro Díaz Santiz, a Tsotsil indigenous man aged 35, who has been imprisoned since 1999 for a murder he did not commit. Felipe Arizmendi Esquivel, bishop of the diocese of San Cristóbal de las Casas, confirms that he has asked for urgent precautionary measures to be taken to protect the life of Father Marcelo Pérez Pérez, parish priest from Simojovel, who has received numerous death threats and attacks. The autonomous Chol, Tzotzil and Tzeltal community of Cinco de Marzo in San Cristóbal de las Casas celebrates 22 years in resistance since they recuperated their lands following the Zapatista uprising. ‘The Movement in Defence of Land and Territory and for the participation and recognition of women in decision-making’ holds its second assembly. Many groups of organised women issue statements, or hold marches and meetings, in honour of International Womens’ Day, including Las Abejas de Acteal, Women for the Defence of Land and Territory, and the women of Simojovel via the Pueblo Creyente. 11th March 2016 marks the 15th anniversary of the March of the Colour of the Earth reaching Mexico City. The International Day against Dams and for the Defence of Rivers is marked in Chiapas with a conference of “dissemination and protest”. Two more communiqués are released, from Subcomandantes Moisés and Galeano, updating information on the forthcoming festivals of arts and sciences, and including excerpts from the diary of the cat-dog. The first reprint of the Zapatista book “Critical thought against the Capitalist Hydra” is released in Mexico. Members of the Ch’ol community of Ejido Tila are consolidating their autonomy since they expelled the local government on 16th December, in particular using their community assembly to organize their own security and that of the thousands of families of visitors, many of them pilgrims, who attend the annual festivities of el Señor de Tila. The Pueblo Creyente of Simojovel hold a march to mark the first anniversary of the Great Pilgrimage from Simojovel to Tuxtla. It is announced that a pilgrimage will take place in the northern zone of Chiapas from 3rd to 10th April, in defence of Mother Earth and to mark the tenth anniversary of the Viejo Velasco massacre. Frayba issues an Urgent Action about the imminent risk of a large police operation to evict and displace 306 people including 109 children and 5 disabled persons, from Altamira La Providencia, municipality of Huixtla. The Tsotsil communities of Los Llanos and San José el Porvenir in the highlands of Chiapas reveal publicly that they have been granted an amparo (order for legal protection) against the San Cristóbal de Las Casas-Palenque highway, which the government has been trying to impose on them since November 2013. The court orders the cancellation of the construction of the highway in the municipalities of San Cristóbal de las Casas and Huixtán. A pilgrimage of more than 200 kilometres in defence of Mother Earth, against the dispossession caused by megaprojects, and in memory of the still unpunished and unresolved Viejo Velasco massacre takes place in the Northern region of Chiapas. Frayba again expresses concerns about the continuing imminent risk to community human rights defenders in Simojovel, especially Father Marcelo Pérez Pérez and members of the Simojovel parish council and the Pueblo Creyente. The displaced families from Primero de Agosto denounce that members of CIOAC-Histórica from Miguel Hidalgo have started to enclose part of their lands. San Isidro Los Laureles, in the municipality of Venustiano Carranza, denounces acts of intimidation in the form of a helicopter overflight with cameras, followed by the firing of gunshots from a vehicle in their community, and call for solidarity with their struggle. The National Campaign in Defence of Mother Earth and Territory is launched on 10th April, the 97th anniversary of the assassination of Emiliano Zapata. The campaign, which is made up of 179 organizations, collectives and associations, aims to denounce dispossession and share struggles for the defence of Mother Earth, to denounce the corporations profiting from dispossession and to show alternative ways of life. During the Fourth Forum of Resistances and Alternatives of the Peoples of the Northern Zone of Chiapas, more than 300 people from more than 60 communities in the Northern and Jungle regions of Chiapas and the Petén in Guatemala come together to reject the construction of dams in this region. Ejidatarios from Tila hold a march to celebrate the realisation of their ejidal autonomy and free self-determination since the expulsion of the municipal authorities last December. A group of around a hundred people come to the ejido in six lorries, led by caciques from the area, intending to provoke a confrontation. On 12th April the EZLN and CNI issue a Joint Declaration on “the cowardly betrayal of the Indigenous Ñatho community of San Francisco Xochicuautla in order to implement the highway project Toluca Naucalpan,” as well as on the assault on community police in Ostula. Las Abejas of Acteal call a press conference to denounce the usurpation of their name, stamp and logo by a different group from Acteal, Consejo Pacifista Sembradores de La Paz, who are spreading false information and want to take over the physical and symbolic spaces of Las Abejas in Acteal, the House of Memory and Hope. A gathering is held in the Ejido Chicoasen from 12thto 15th April, for the Non-violent Transformation of Conflict in Defence of our Territory, attended by representatives of communities in Chiapas affected by dams, mines, gas pipelines, and other megaprojects. The third anniversary of the assassination of Juan Vázquez Guzmán is remembered with a commemoration at his family home. An interview with Subcomandante Moíses, spokesperson of the EZLN, by the Ukrainian journalist Oleg Yasinsky is released on YouTube. The Otomi-Ñatho community of San Francisco Xochicuautla, in the municipality of Lerma, Mexico State, has been resisting the construction of a highway and won the definitive suspension of a presidential decree to expropriate part of its lands. In spite of this, up to 1,000 state police forcibly enter the community, and permit the entrance of bulldozers which demolish a number of houses on the planned highway route, beating and evicting people. There is a huge response to this attack, and the state suspends construction and offers damages. On 12th April, the Peoples Front in Defence of the Land (FPDT) from San Salvador Atenco report the forced entrance of an army tank into the communally owned lands of Atenco, Mexico State, escorting a group of workers from a private company that carried out studies for the construction of the new airport. The Senate passes the Federal Law for Special Economic Zones. The law establishes preferential conditions for national and foreign private companies, and in effect, plans the expropriation of all territories required to establish investment projects. One of the five zones is Puerto Chiapas, designed to facilitate exports to Asia. The EZLN and CNI denounce an attack made on 14th May on the Binizza people of Álvaro Obregón, Juchitán, Oaxaca, who are struggling against a wind energy project being imposed on their territory. There are fears of an attempt by the government to crush the entire autonomous project. An important new book is published in Spanish, Zapatista autonomous justice: Tzeltal jungle Volumes II and III of Critical Thought against the Capitalist Hydra are published in Mexico. They represent the rest of the contributions made at the seminar/seedbed of the same name which was held in May 2015, and are published in the order the presentations were made. Volume I is now being translated into English, French, Italian, German and Greek. Various preparatory events are being held for the ‘Comparte for Humanity’ Festival in towns and cities in Mexico, and in Barcelona. The festival will take place from 17th to 22nd July in the Caracol of Oventik, and then from 23rd to 30th July, 2016, in CIDECI, San Cristóbal de las Casas, Chiapas. On 30th May, the EZLN issue a communiqué “May, between authoritarianism and resistance” about the teachers’ movement, signed by Subcomandantes Moisés and Galeano. It makes clear that the EZLN fully supports the teachers in their fight against the education reform, and asserts that with the repression and the refusal to dialogue and negotiate, the government is violating the law and the constitution. According to the National Water Commission (Conagua), rainfall in Chiapas during April was 19% down compared with figures for the previous twenty years. 3 major rivers have dried up in the state of Chiapas, and at least 40 municipalities are seriously affected. Tojolabal residents of the Ejido Guadalupe Victoria, municipality of Altamirano, denounce the invasion of their lands by people who abandoned the community voluntarily after the 1994 uprising, led by caciques from the PRI, saying they are there under orders from the government and CIOAC. An armed attack takes place on the town of Simojovel when up to 150 paramilitaries and members of the PRI throw tear gas, molotovs, stones and rockets in the streets and the central park, which are thronged with people. The community authorities circulate a video saying they will not permit the displaced people to return to Banavil, Tenejapa. Ejidatarios from San Sebastián Bachajón denounce that political party members have taken over the tollbooth and impeded the officially elected ejidal commissioner’s access to the ejido. At the same time, they announce that they have recuperated some hectares of land belonging to them. Later, they denounce an attack on a community member and his family by the leader of a group of paramilitaries and his two sons who also serve as state police. On 5th May, the community of Cruztón celebrates the ninth anniversary of the recuperation of 249 hectares of its lands. A few days later, a member of the organization is detained and tortured. The Tsotsil community of San Isidro los Laureles, which recuperated 165 hectares of its lands last December, is invaded by 40 trucks of police and paramilitaries who open fire, ransack homes, burn possessions and destroy crops. The community of 60 families is displaced. The Pueblo Creyente of Zinacantan declare an alert against water privatisation, warning that the municipality plans to tax water use. Residents of several communities in Chicomuselo arrest four people who say they are promoting a mining project. They denounce that the mining companies continue to divide the communities by offering money to set up projects in the region. Coca-Cola are digging their third well near their plant in San Cristobal de Las Casas. More than 5,000 people living in the vicinity already have no water supply and have to buy their water. Zapata lives, and the struggle continues….. Although less in the public eye now, the Zapatistas remain strong in their autonomy, with ongoing support and solidarity from different corners of the world. The organisation has matured and grown in confidence and now has a fully indigenous leadership, with the support bases in the autonomous communities coming more in to view, many of whom have now been born and grown up in the revolution. Faced with constant attacks and attempts to take their land by paramilitaries, police, elected officials and political party members, and also with government-sponsored media disinformation campaigns and “support” programmes, the Zapatistas continue to strengthen and build their autonomous structures and communities, and also another, better, world….